Rhizophora is a genus of tropical mangrove trees, sometimes collectively called True, or Red Mangroves. All Rhizophora species have arching stilt roots that emerge from the trunk, hence their scientific name Rhizophora which means “root bearer” in Greek. Rhizophora use ultrafiltration at the root level to exclude salt. It is believed that they store any salt that gets through in old leaves which they later shed. Rhizophora grow best in wet, muddy and silty sediments. The tiny flowers are wind-pollinated, producing lots of powdery pollen and no fragrance or nectar. They are also self-pollinating. The fruit does not fall away when it ripens. Instead, the single seed within the fruit starts to germinate while it is still on the mother tree, and the mother tree channels nutrients to the growing seedling (vivipary). The seedling forms a stem (called a hypocotyl). When the seedling finally falls, at first it floats horizontally, and drifts with the tide. It can survive for long periods at sea. After some weeks, the tip gradually absorbs water and the seedling floats vertically and starts to sprout its first leaf from the top, and roots from the bottom. When it hits land, it grows more roots to anchor itself upright, and then more leaves. Rhizophora seedlings grow rapidly to avoid being submerged at high tide. They can grow by 60cm in the first year. 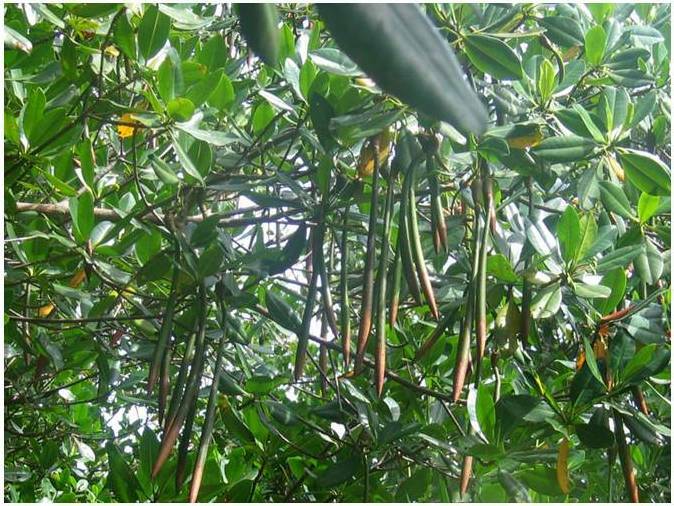 Because Rhizophora are fast growing and flower within their first year, they are often used to replant mangroves either for conservation or as part of a managed forest to produce timber for construction or charcoal. There are three species of Red Mangroves in Fiji – Spotted Mangrove, Samoan Mangrove and Hybrid Mangrove.